Why are countertop magazine racks so practical? The space-saving design, of course. Other stands can be problematic when it comes to finding the space to install them. 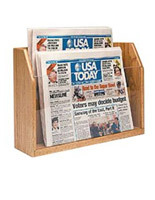 Countertop magazine racks, on the other hand, take up very little space yet offer a great deal of organizational power. 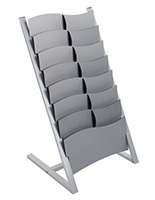 These tabletop literature displays come in both single and multi-pocket configurations. 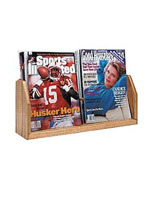 This way, users can decide exactly which countertop magazine rack is best based on the size and quantity of their publications. 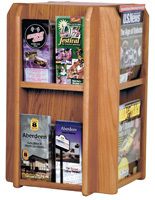 A tabletop literature display is often placed at a checkout stand or on a help desk counter, where customers are assisted. Guests and patrons can quickly spot the information as they approach, which can really help streamline the customer service experience. Customers enjoy perusing company information while they wait, so be sure to set up tabletop literature displays at all your service areas. 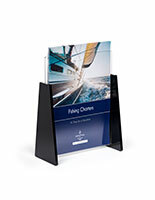 Adjustable dividers ensure all sizes of promotional trifolds and newsletters can be accommodated. How can these tabletop literature displays with pockets be sized to fit both pamphlets and catalog sized publications? 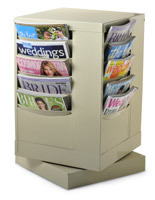 The countertop magazine racks come in several different styles with varying pocket width. Read about each type and understand the which advantages the specific design offers your application. Standard magazine pockets measure a little over 8.5" and will fit full sheets of letterhead paper, company catalogs, and traditional magazine publications. 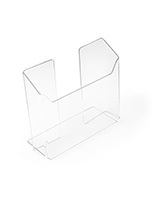 Booklet sized holders are usually 5.5" or wider to accommodate different styles of leaflets. Many companies get quite creative and design their own collaterals, and these units offer the perfect dispensing solution. Tri-fold style pockets are also available. These configurations are sized for conventional brochures and pamphlets, but some are actually a little narrower than the standard 4" x 9" and can fit information as small as 3.5" across. Adjustable pockets are extremely popular because they will fit wide or narrow reading materials. 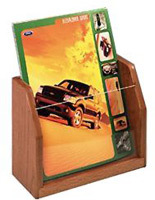 Usually these desktop literature holders feature some kind of removable peg or hook that enables the user to change the width almost instantly. 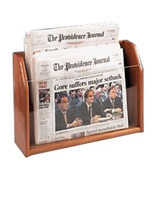 If you have many different publication sizes to hand out, consider one of these versatile countertop catalog dispensers. So now that we've discussed some of the different compartment styles, let's talk about the number of pockets on each countertop magazine holder. 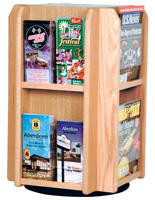 Single pocket racks are great for businesses that want to put out a single stack of pamphlets or catalogs. 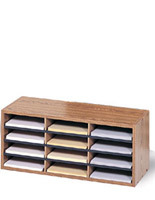 Whether clear acrylic, metal, wood, or corrugated cardboard holders, multi-pocket literature systems are ideal when there is a variety of reading materials to display. 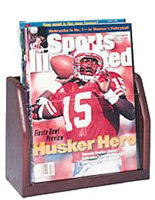 Some multiple-compartment magazine holders feature as few as two pockets while others have as many as 16 pockets depending how they are formatted. As mentioned above, take a look at the adjustable options that change from one publication format to another. 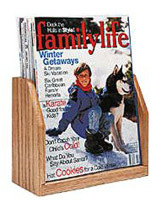 Many times, these modular catalog displays for desktop use can accommodate two different sized publications at the same time. 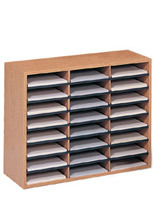 Think about how the tabletop stands will be used and what literature will be displayed before selecting yours. 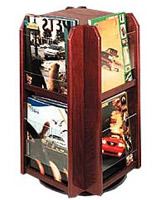 There are all kinds of ways to use these brochure holders and catalog display racks. In fact, many local businesses build a sense of community by handing out referrals to non-competitors. This helps generate interest from visitors and townsfolk alike. 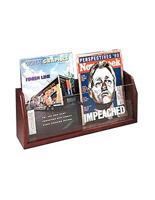 Information centers, restaurants, and mom-and-pop stores really thrive through this type of community promotion that can be supported by quality tabletop magazine holders. Other locations, like hotels and hospitals, also hand out referral information for a number of different reasons, so you know this business building technique is tried and true. Any of these small desktop style literature stands is perfect for getting the word out, especially if you are trying to build awareness in a localized community. 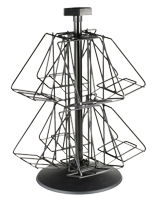 Never underestimate the options these commercial displays can have, whether selecting a clear magazine rack, wire, plastic, or wood holders. Don't forget to analyze the material used to manufacture the literature display! We have economy as well as upscale options to accommodate every budget. Cardboard is one of our cheapest choices. These corrugated boxes fold to save space and money on shipping costs. Plastic designs are also priced to sell, but offer a longer term solution. Acrylic is similar but is stronger than some of our plastic models. 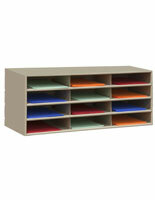 Wire literature holders are stronger still but are not as expensive as their durability implies. Metal is of course the strongest material we use to make the desktop literature dispensers, which is why they cost a bit more. 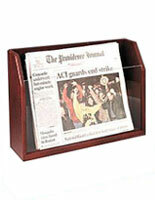 Wooden racks are also very durable and are priced similarly to that of the other upscale publication holders. Keep in mind that there are many finishes for the different materals, as well so finding the right match is simple at MagazineRackShop.com!